Combine all ingredients in a blender and blend until smooth. Yields one 2-1/2 cup serving. Try any of the following combinations or make your own. If you use frozen fruit, you can omit the ice and add up to 1/2 cup of liquid to adjust thickness to your preference. These are easy to double in size - just double the amount of every ingredient except for the flavoring. Keep flavoring at 1/2 teaspoon. Taste before you add honey to determine whether you'd like it to be sweeter; many fruits make the smoothies sweet enough without added sweetener. You can replace up to 1/2 cup of the fruit with leafy greens. 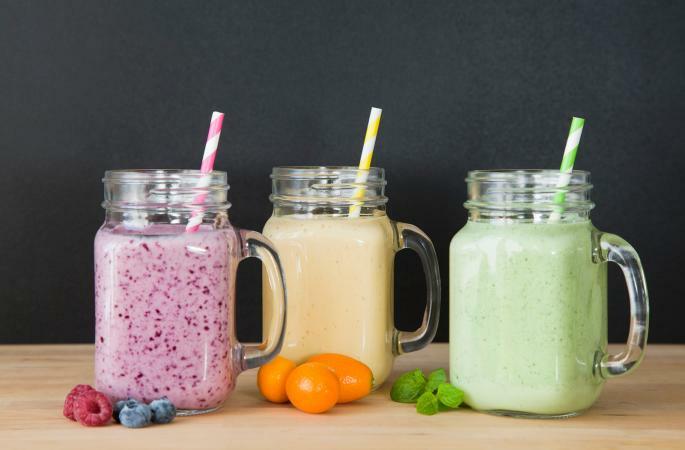 Smoothies are a quick and nutritious way to start your day. They also make good snacks, so start your blenders. Making smoothies is a fantastic option for adding a little more fruit to your life.